An early spring afternoon a few days ago along Milwaukee Avenue, south of North, east of Damen, so far removed from the Wicker Park of the 1990s: I pause in front of Myopic Books, still standing, surrounded by storefronts peopled by yupscale saloons, Levis, American Apparel, and remember the days when it was Earwax Café, the front windows there? It had two-top tables in both the plate-glass windows where you could watch the passersby on the street, or turn your head, and watch the other customers, and on certain days and nights, catch sight of a clutch of furiously productive scribblers, which could include Chris Ware, Daniel Clowes, Archer Prewitt, Gary Leib, among others. They hadn’t “arrived,” but they were there. I was, too. The food was cheap and heavy, tending to the vegan, and the ashtrays were as often filled with torn-up notes a writer had digested or an artist had rejected as with ashes. My clearest memory of sighting the young artistes was while awaiting a momentous date with a not-yet-girlfriend, sitting at the table in that window, the girl who looked into small tatters and saw her name, and looking away with mild mortification over her shoulder and catching sight of scribblers off to the side, taking in the smell of the food and the not-quite-burnt coffee in the air before looking back at her blushing face. The scraps, the girl, the general atmosphere: plus the furious nurture of a few of the founding foundlings of the still-spreading school of Chicago cartoonists hunched over a free meal. 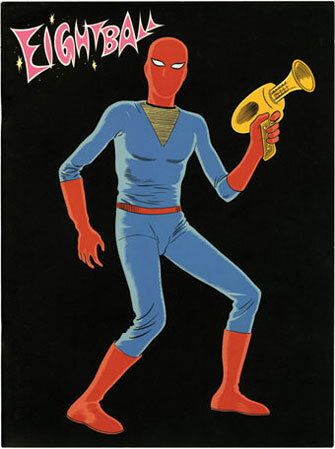 Now, in the decades since, Clowes’ lovingly rendered Midwestern grotesques have colonized the consciousness of a couple generations of readers far beyond the Chicago comics scene in the waning of the twentieth century. I like talking to Dan. He laughs easily and scores points quietly. 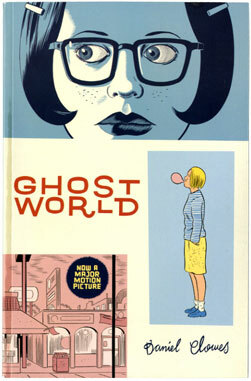 We were talking since the 1990s, but I’ve had agreeable structured, journo-subject interviews with Clowes since at least the 2001 release of the movie of “Ghost World.” We tried to remember if and when our respective pasts might have first crossed in those formative Chicago years. It could have been a gallery opening for Ware’s work, he suggests, but we figure it might also have been at some casual locale like the Rainbo Club, and we had probably bristled at each other at some point or another, with a fine mix of shyness, fear and hostility. 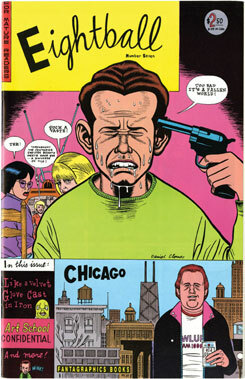 “In the way we do—we Chicagoans do,” Clowes agreed, laughing. Father, husband, screenwriter, Oscar nominee for “Ghost World,” and author of Fantagraphics’ spanking new, door-stopping, $120, 560-page, two-volume reproduction compendium, “The Complete Eightball 1-18,” Clowes and I set out to talk topography. The nuts and bolts (such as the childhood discovery of “Strange Adventures” #161) and paper (4-ply Strathmore Bristol Board 500 series, kid finish) and drawing tools (4H mechanical pencils; Rapidographs; Wite-out) you can find at length elsewhere. 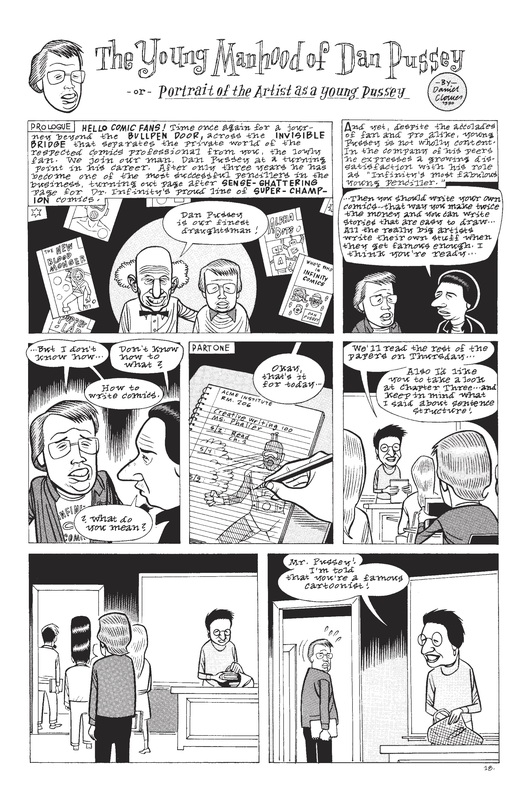 Clowes is lucid on just about any topic, especially the layers of sedimentation just beneath his work. 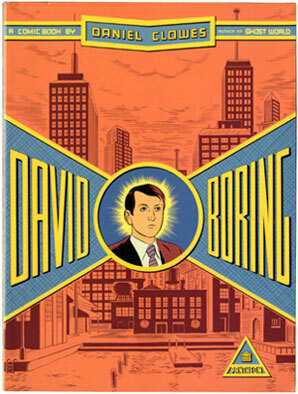 But he’s a witty conversationalist across a continuum of subjects, attesting to a fine curiosity when away from the hand-crushing work of comics and the expectations-dashing work of screenwriting. We set out to talk less theory and practice then have a brief walkabout of Clowes’ Chicago, maybe define what, even after a decade in Oakland, California, still makes him a Chicagoan, what part of Chicago rests in his bones. Drawn from multiple conversations, this piece was commissioned as the cover story of the second issue of The Chicagoan, an ambitious, even visionary project to chronicle this city and its times that eventually fell victim to the chronic stinginess of those who hold fast to the money in this city and these times. It benefitted greatly from the steady editorial hands of J. C. Gabel and Sybil Perez. Let’s define your Chicago. What neighborhoods were you in, and at what age? My Chicago was defined by very solid boundaries. I was in Hyde Park and we never went above 47th Street or below 59th Street and we stayed pretty much within Cottage Grove and the Lake. Was it a wholly functioning community? It was. I later learned it was the most successfully integrated community in America. I don’t know if you’re familiar with the writers Jack Lait and Lee Mortimer. They wrote a series of books—I think their first one was “Hollywood Confidential”—and then they did “New York Confidential.” They would cover each city, tell where you could buy opium, and where there were prostitutes in each city. They were like New York Post reporters. There’s one about Chicago and they refer to Hyde Park as the home of interracial love. I have that book and there’s another book from the twenties that refers to River North as Bronzeville. They’re full of the slang of the moment, things that are often jarring today, like a particular shop was the place where you could get all kinds of smoke—the kind you hold and the kind you hold in. Yes. My mom and dad were Maxwell Street types who had gotten there in the sixties back when it was still going. My Sunday activity was to hang out at the Maxwell Street flea markets, but with the really good crazy old blues guys just playing on the street. There’s a documentary about Maxwell Street, “This is Maxwell Street,” that is very much the world I remember from being two and three, buying old used-car parts with my mom. Can you remember street food, looking forward to a Polish or something like that? Not really, no. My family wasn’t so much connected to that part of Chicago. We never went and got “David Berg Vienna Beef Hot Dogs.” The only place I remember going with my parents was—I don’t know if it’s still there on 53rd Street—was called Valois. Of course everybody pronounced it “Val-oo-ees.” The big sign on the window said, “See your food.” It was like an old-fashioned cafeteria. Valois is still there but that sort of evokes the Busy Bee in Wicker Park before the turn of this century. Absolutely, yeah. I moved there later in life and went to the Busy Bee everyday and that really felt like it was preserved in amber. Once a week, I would see Studs Terkel come in and sit with some old Polish union guys. You felt like… this is going to last forever. A bowl of chicken rice soup with yellow globules on top, two dinner rolls, one pat of butter. That’s right, two dinner rolls. You don’t see that plate any more. You’ve described the neighborhood where you were from as inner city, but it was close to the University of Chicago. So you had academia and auto body shops, people who would do thinking and typing, and then people who were taking a tire off. That was my family. My mom and dad were in the car business. Basically, my dad was an engineer and was involved in auto racing. And my mom, through him, got interested in cars and later wound up divorcing him, marrying his racing partner, and opening a shop on Stony Island, right where the Skyway takes off at the end of the Illinois border with Indiana. My childhood was really sitting at restaurants listening to guys yammer about car parts for hours on end. To this day, I have no idea how a car works, nor do I want to know. It was called Hyde Park Auto Service. Originally, it was called Foreign Auto Repair, I believe. At the time, foreign cars were exotic and they were the only guys in town who could fix a Triumph or something like that. And you went to the University of Chicago Lab School? Yeah, I did do that. That sounds more genteel than your average head-cracking urban high school cliché. True, it was. Though I think everybody’s school seems traumatic to them. I thought of it as a very oppressive atmosphere, but it wasn’t physical danger. It was more mental torture at the hands of the children of the smartest people in America. Not the impression I had of it nurturing your aloneness. Were you a big bully target? No, there weren’t really bullies, although I have to say in the neighborhood, back in the seventies especially, we were all beaten up on a weekly basis, had every bike stolen, our backpacks stolen, and our hats taken off our heads on the way to school. It was always sort of a climate of danger. The urban jungle up to five feet tall. One of my clear memories of growing up in Hyde Park was at some point in the seventies there was a feminist movement to draw outlines on the sidewalk with a stencil that said “Woman Raped Here,” which really kind of lent a disturbing quality to your daily walk to school. I had to go by like six of those. Which doesn’t make the neatest transition to talking about what you saw on TV. Did you watch the clunky superhero cartoons? This would probably be the era just post-“Clutch Cargo,” so it’s more than ten frames per second of animation, but they had that weird look. TV was a very exotic thing in my family. People were opposed to television in many Hyde Park homes so we had a little black-and-white TV set that was hidden in my grandfather’s room. He would only watch it if one of his colleagues from the university was on a talk show or something, so I was allowed to watch very, very little. The only show I watched religiously was “Garfield Goose,” which was the local kid’s show on WGN when I was growing up in the sixties, early seventies I guess. That had all kinds of funky cartoons that any Chicagoan my age remembers, as though we all share the same nightmares or dreams or something. “Clutch Cargo” is one of them certainly, and every Chicagoan my age remembers these Christmas cartoons they used to show. One was called “Hardrock, Coco, and Joe,” about these three little stop-motion animated elves, and there was one called “Suzy Snowflake.” Those are stuck in our brains forever, no matter what. You’ve made allusions to strange comics being strewn along the garden path of your childhood. Pretty much. I had an older brother—he’s ten years older—who was a bit of a media junkie, like all kids back then. I was born into a legacy of monster magazines and old comic books, Science Fiction Digest, all the kind of stuff nerdy-ish kids from Hyde Park would read back in the day. I remember every MAD magazine that anybody ever had had the cover ripped off because everybody would take them off to do the fold-in. So I have many copies but I never knew which issue it was. Where I grew up you could buy them without covers when the covers had been returned to the distributor. They would sell them for five cents instead of twelve cents. Yeah, there was a local toy store in Hyde Park that used to sell them shrink-wrapped, ten comics all with just the corner of the cover cut out, and we always knew there was something fishy about it [laughs], but it was too good of a deal. They would always stick the Baby Huey comics in the middle. So there’d be a Spider-Man one on the outside and then just all—like Sad Sack was always the worst case scenario—comics about an old sad army private. In the nineties, as far as comics went, there was Quimby’s on Damen, which we’ll get to, but when you were little, were there any special places where you would find the comics? Remembering my tiny town in Kentucky, you could buy comics just about anywhere—the IGA, Presley’s Five-and-Dime, the Corner Sundry, Blue’s Café. The Hyde Park one that I look back on, and that I actually thought I had imagined or dreamed until I ran into a friend who remembered it also, was on Woodlawn, near 55th. There used to be a drugstore that had a comic book machine, which was a very, very rare thing that only existed, I think, in the early sixties. It was when comics were twelve cents and it had this little divide where you put a dime on one side, and two pennies on the other. Push in the lever and a comic goes through these rollers and comes out at the bottom. It was the most fetishistic—I remember the very last part of it, you had to kind of pull the comic out, and it was like the birth canal of great art or something. You could select your comic from the window and there was something so great about that, but why did they need a machine? Couldn’t they just sell them on a rack? So you could buy them without embarrassing yourself. And you’ve just defined fetish in a keen way, where it’s a physical action that’s repeated just because it turns you on. Yes, that I remember from being very young. After that, it was kind of a crapshoot. You’d have to go over to the Co-Op or any of the grocery stores and just hope for the best. But later there was a famous newsstand over on Lake Park around 51st called Bob’s Newsstand, which was one of the biggest in town. He had everything. Actually, my best friend in high school got a job there basically just so he could steal comics. He got like seventy-five cents an hour or something and then they looked the other way when you took all the comics. So I would go over there and he would give me a discount on all the weekly comics. So let’s go to the first ostensibly grownup years. What flung you back into Chicago? I was living in New York and I was trying to make it as a commercial illustrator and that just didn’t work out. I had basically figured out how to live there for about six months until I was rich and famous and then the money just ran out. So I went back to Chicago as a default and first stayed in my grandmother’s house in Hyde Park, kind of where I grew up, and then ventured out into the unknown territory of Wicker Park. I love how the business card from New York City, in “The Art Of Daniel Clowes: Modern Cartoonist” monograph, is completely chewed up. 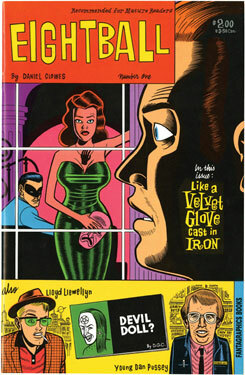 [Clowes laughs] It feels just right from that trajectory. If you run with your tail between your legs, all you’re going to have is this half-incinerated business card. Then you lived on Division Street, this unwitting 1980s revisiting of Studs Terkel’s “Working.” “New Grub Street” for the pen-and-ink set. It’s sketchy how rude and rudimentary all these neighborhoods were then. How did you get there? I think I was driving. A friend of mine, who was into older underground stuff and knew all those guys said, “Hey, Jay Lynch said we can come over any time. Let’s go visit him.” And I was like, oh my gosh, Jay Lynch, my childhood hero, author of ‘Phoebe and the Pigeon People’ in the Reader every week! So we just drove over and it was one of those many times you go somewhere in Chicago where you realize, I’ve never been anywhere around here in my life. I grew up on the South Side and never went anywhere that wasn’t near an El stop or a big common bus line, and I’d never had any call to go anywhere near Wicker Park, so I had no real sense of where we were. I remember we just sort of pulled up in front of his house and there were so many cars that were just stripped down to nothing. It was sort of like that was where people left their cars instead of actually trying to get rid of them properly. They just went there and scraped off the VIN numbers. It was freezing cold, the middle of winter, so it was like these guys had set a car on fire just to keep warm or something [laughs]. It was so apocalyptic. It was back in, what, 1982? The whole city was kind of like that. What do you like about Oakland? Oakland is very similar to Chicago to me. It has a lake in the center, which is a very small lake, it’s maybe a mile-and-a-half across, but the way it’s set up feels very much like if you’d go to the lake at what we used to call “the Point” in Hyde Park. As a city, it’s very small, only 400,000 people. It feels almost like a diorama of a city or a model of a city, where it has only one really fancy art deco building, one garish modern Catholic church, et cetera. It has one or two of everything and my brain can assimilate that much more easily than I can in a place like Chicago. I like to have a sense that I know a lot about every part of the city of Oakland, which I never felt in Chicago. I always felt like there were huge expanses of the city that I had no real interest in and had never been in in my life. Obviously the same with New York, or even San Francisco feels like that, but somehow Oakland is manageable. Do you find the place lends itself to walking and thinking? 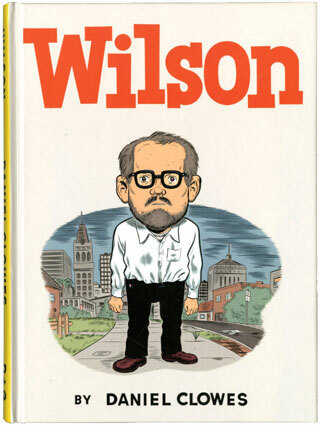 I’m not picturing you as an advanced version of Wilson [the titular character in Clowes’ 2010 graphic novel]. Well, you should picture me like that [laughs]. It’s a great city for walking. I love bringing Chicagoans here because there are all the hills, which you get used to after a few years, but Chicagoans are always wiped out. Even people who are in really good shape can’t handle the hills. It’s kind of amazing. When I am in New York, I can walk like fifty miles and not be tired. It’s just so flat. Walking here is not the same. I did not feel like this would be the new hip world when I moved there at all. It didn’t feel exotic, it just felt grotty. It felt like this is where you live if you want a pretty big apartment for no money at all. When I think back, my apartment must have been close to 1,800 square feet, with eleven- or twelve-foot ceilings and I think I paid $350 a month or something. It was just unbelievable. Chris Ware always says there’s a time in the nineties when the two of you discovered you could have hit each other with a tennis ball from your back porch to his front stoop. Oh, absolutely. If I had had windows on the north side of my apartment I could have looked right into his studio pretty much. And you didn’t know this when you first met. You discovered it after. And, of course, the buildings on that entire street and some further west in Ukrainian Village are now in “Building Stories.” Looking at that, it’s so amazing. I stared at these buildings, but he saw much more than I did. The building I lived in was the very first that somebody had bought for nothing and decided to rehab and try to rent out and then that happened to every building around it. This would have been the mid-eighties? I would say 1985 to 1986. Maybe late in 1985. That coincides with one of the last surviving bars, the current incarnation of the Rainbo Club, which survives as it was, with the same owners over the past twenty-five years or so. But that whole Milwaukee Avenue corridor is basically gone. Myopic is a fantastic bookstore but Earwax, Urbus Orbis, all of that is gone. When I first moved in, you would see the Urge Overkill guys all the time. They were very distinctly the only proto-hipsters you would really see walking around. When they got me to do their album cover back in 1989 or 1990 or whatever, they saw my name on my buzzer and rang the buzzer at like two in the morning. That was the middle of my workday so I was happy to have company, and that’s how that happened. So who was among the clutch of knuckleheads at the Thursday mini-comics Kaffeeklatsch at Myopic? At the Earwax. 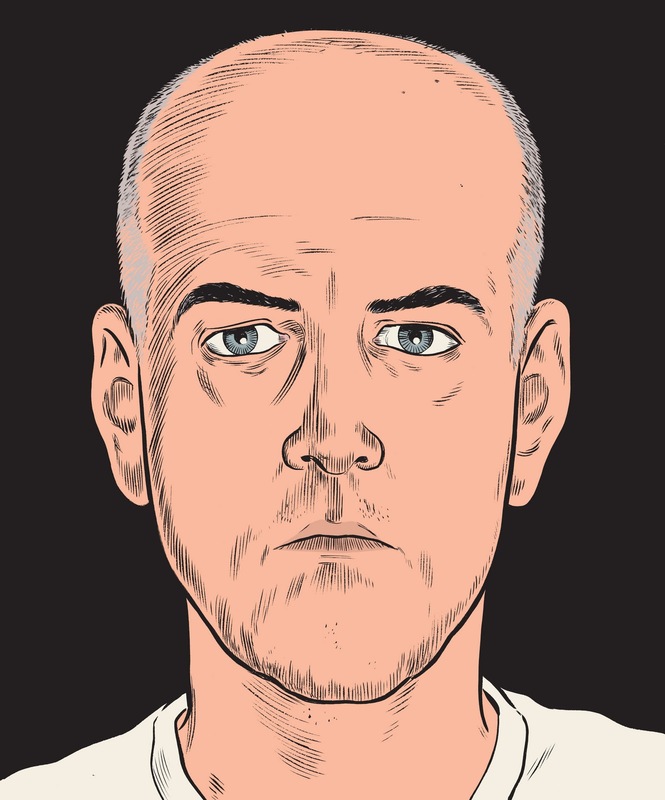 It would have been Chris Ware, me. Gary Leib was kind of the instigator. That’s his world, doodling and spontaneous drawing, just kind of letting it happen like that. The rest of us are all much more uptight and it was much less comfortable for us. There was Terry LaBan, who went on to do a daily strip. He did a lot of work I can guarantee he doesn’t want anybody to know about now. Archer Prewitt was another one. I do remember finding torn-up scraps of paper in the ashtrays at that incarnation of Earwax. There were a lot of people who would draw and then tear their work apart and get the hell away from it. There was a guy, I think he went to the Art Institute, who used to do these really bizarre drawings he called “drawdles.” It was like doodle and draw mixed together that just looked like insane circuit boards or mazes or something. We had a rule that all mini-comics had to be drawn on the back of a flyer for a rock show or whatever; we couldn’t actually bring paper. We would often grab a stack of flyers and we’d turn them over and they’d already have drawdles on the other side. He beat us to it. So you’re drawing on the backside of paper, and Chris has said that you all got coffee for free. Did you have any money? No, nobody had much money. I mean that was the great appeal of it. I think most cartoonists are inherently cheapskates. Cheap dates and cheapskates. At least Gary and I had worked it out so that we did all the drawings for their menu and we did the artwork for their sign. Because of that, Nick, the owner, said, “You’ve got a tab for as long as you want.” Obviously we could have abused it and he would have cut it off, but we were too weak for that. We could eat meals and drink coffee there kind of endlessly for free, so we took great advantage of that. There was a time when we got comics at Quimby’s for free also, for doing some kind of work, I can’t remember what we did, but we could go to Quimby’s, get free comics, and then go have a free dinner. I don’t think I’ve ever been happier than when that was going on. 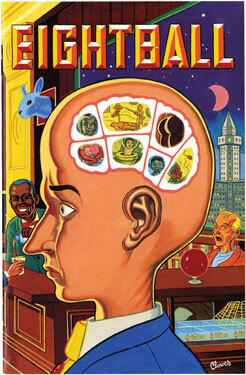 About the menus and drawings at Earwax, do you remember any in particular? I recall some exquisite-corpse-type stuff. Was it a matter of, “Here’s a fun quick can-you-top-this-as-quickly-as-possible drawing; we’re going to get some food bartered”? Regarding the menu drawings, I think the guy who originally opened Earwax, which was another terribly named establishment—originally it was called Earwax Bombadier, spelled incorrectly. There were so many names like that. Around the corner, east on North, there was a record store, the Quaker Goes Deaf. Yes, and so Nick, the poor fellow, who I believe was more in charge of the Bombadier, which was the café part of Earwax—Earwax was music, books, and a café, which made no sense, but Bombadier made no sense either—was sort of the jovial host of this place and kind of figured out who we were. Or maybe not, maybe he just liked our drawings. One day he gave us this blank menu and said, “Hey do some decorations on this, we’ll print them up, and you guys can eat for free.” That was way too good to pass up. It’s funny how there is something so much better about getting a free ten-dollar sandwich than getting paid ten dollars. Ten dollars is insulting to be paid, but a sandwich is not somehow. I can’t explain that. It would not have been the restaurant I would have eaten at had I been able to choose but the freeness really added to it. I just looked at Chris’ first published Acme sketchbook earlier today and decided not to go deeper. I just know there’s this drawing of me that looks like I’m melting on page 200, captioned, “Ray Pride typing on his ‘Powerbook.’” What’s your particular history with the original Quimby’s? Remember where it was, on that weird residential block? It made no sense. I moved to Wicker Park having no idea whatsoever that it was about to be a cool neighborhood. We were just looking for a big, cheap apartment back in 1988, or whenever it was, and I remember walking by that little storefront and I remember they were putting something there. And we figured, okay, it’s going to be a dry cleaners, or a fortuneteller, or something like that, and I remember walking with Gary Leib and we were sort of joking like, maybe they’ll open a comic store! So that was literally inconceivable. And then we started to see little signs of life, like, this is going to be something interesting. And then we finally realized, not only is it a comics store, but it’s one basically devoted to the kind of things we like. It was one of those moments in your life where you feel like, okay, clearly we’re all lying on gurneys somewhere and thoughts are being programmed into our brain by aliens or clearly there is a god and he’s setting us up for something. It’s just so unlikely that two blocks from my house would be the preeminent zine store in America. He had no idea Chris or I lived there or anything like that! It was just one of those miracles that happens very, very rarely. It’s the old joke—serendipity, you’ve got to count on it. Exactly. It opened, and all of a sudden Earwax opened, and we had a total barter system lifestyle for a while, where we would do artwork for comics at Quimby’s and artwork for food at Earwax. What more did we need? I’m looking at the storefront on Google maps right now. Is there anything there now? It’s a ground-floor apartment with a suburban-type aluminum door. It was not a good foot-traffic area at all. The only people that walked by it were people who lived where I did over on Division who were walking to the El. There was just nothing. It was near that old-folks home. It was just a really downbeat, grim, little spot. I remember the original name, which Eric Kirsammer dropped when he took it over, was Quimby’s Queer Store. He was using the word “queer” in sort of the Edward Gorey sense, like “the old curiosity shop.” Back then there was no Internet, obviously, so people would find bookstores like that through the phone book. I remember we all said, “People are going to look in the phone book and think it’s a gay store, a very specific market.” It didn’t describe what it actually was and I remember Steven Svymbersky [the original owner] always said, “Anyone who is offended by the term queer, we don’t want them in our store.” I said, “It’s not that they will be offended, it’s that they will think it’s something it’s not.” But he stuck to that to the very end. I can’t tell if it was just so crack-potted it actually worked to his advantage or if there were a lot of people coming in and saying this isn’t what I thought it was going to be. Is that right? I never knew that. Wow, I’ve got to see it. I remember when that came out and I remember there was some reason a lot of people saw it, so maybe that was it. There are a lot of crunchy old Wicker Park apparitions in there just because that’s what happens on the lowest-budget films, even now, is if you just point the camera out the window, it’s the equivalent of “Safety Last!” opportunely recording 1922 Los Angeles. What does the sense of a city mean to your work? Do you still sense Chicago in what you draw? Well, I don’t know. After twenty years in California I think perhaps I’ve hit a tipping point. I think I’m fifty-one percent Californian in my psychic landscape. But that whole Chicago thing, I spent so much time as a kid playing in the alley behind my house. There are no alleys in Oakland or on the West Coast, really. I guess Los Angeles has alleys, but up here it’s just unknown. I feel a real connection to that web of back alleys in Chicago. There is a notion of you as a laureate of the back alleys of the Near North Side of Chicago. 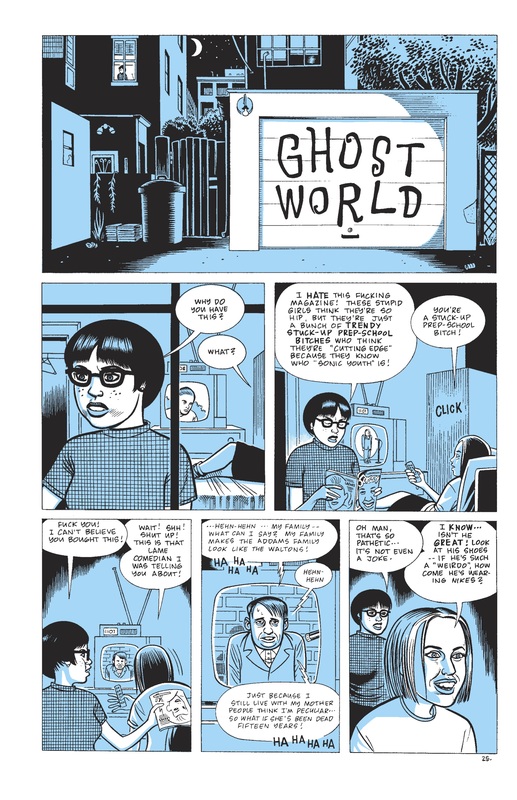 In the comic “Ghost World,” it’s sort of like Chicago, but sometimes there are palm trees. As an outsider looking at someone’s work, talking about process, it’s taking the boxes they’ve placed the world in, and then finding my own boxes to put those boxes in; but like you were just saying with the palm trees, I do think most artists try to move as close to instinct and away from endless contemplation as possible, right? Otherwise you’re thinking instead of working. Occasionally it’s important to have a location thought out and it has some kind of meaning, but I often find the instinctual parts of my brain are best for this. I always say when I’m doing my best work, it’s as though I’m walking up the stairs, holding a cup of coffee and plate, and all of a sudden I have to open the doorknob. Somehow my brain figures out how to do that without any conscious thought behind it. If I actually thought about it, I would end up putting everything on the floor and then opening the door. That’s the kind of work I’m trying to do. Letting that cartooning muscle take over. I don’t draw but I tend to dream a lot about spaces where I’ve been in my life. I return to rooms, apartments, when I sleep. There’s nobody there. They’re just spaces and when I take photographs, I discover afterward I often frame things like these dream-impacted memories. That seems to make sense in talking about how you draw these spaces. You’ve said before that taking a lot of photographs of the back alleys is a pile of crap. I have to try to think my way through it. I’ve been working on a comic where I have to draw a lot of cars and it’s set in different eras so I have to make sure the cars vaguely look like a car from a certain era, like there’s not a 2006 Subaru in 1919. But I’m trying to do it without looking at pictures and it’s interesting how you remember how cars looked in different eras. I actually drew a car recently that looked sort of like it could be from any era and I really wanted it to look like it was from about 1978, so I colored it a sort of puke brown with a light vinyl roof and all of a sudden, there it was, 1978. It was perfect. You just evoked it without drawing it. In the “Ghost World” comic there’s this exchange: “Look at this. I took this when I was eight.” “How long has it been there? It’s so weird you took a picture of your garage.” That graffiti was just one little detail, and the great thing is that all of us have hundreds of things we see, but don’t look at, and you picked that one. The endless implications of the phrase are meaningfully meaningless. 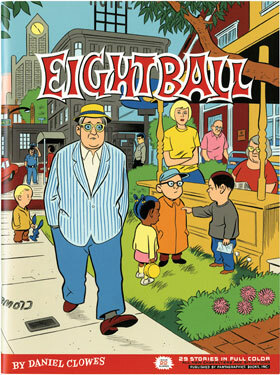 “Eightball” was that, too. I wanted something that really didn’t mean anything. When you picture an eight ball, you imagine a black ball, the most formless thing I could imagine. A ball being a shape that has nothing you can alight on. It has no surfaces. It’s just this kind of infinite void and then it’s black. I thought it was perfect. The perfect thing for a name for something that is utterly blank and yet seems like it’s something. Greil Marcus, for one of his walkabouts, used this great phrase, which sounds like crap at first, but is beautiful at the same time. He refers to “old, weird America.” It sounds lazy, but then you think about it, it’s onomatopoeic in a way. All of this is about deciphering things that have already become invisible. Chris and Ivan Brunetti are great speakers about the notion of hieroglyphs, about the idea of the comic being a hieroglyph. 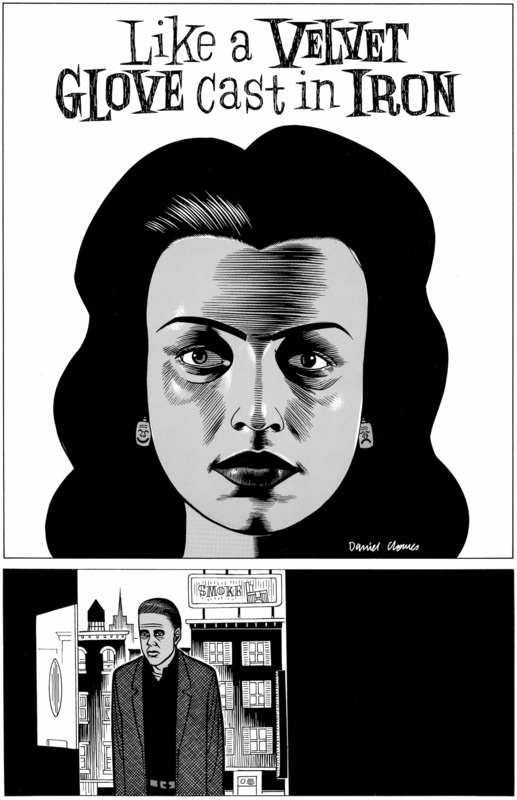 To take something like “Ghost World,” or when Crumb did that notorious series of power lines that are all tangled up, the furious tangle, it’s interesting that the comic form and/or language or just any properly applied art form, has these things that seem so concrete and yet so evocative. Do you agree? Well, they are for me. I can never tell if the kind of comic symbols I respond to so strongly have meaning to anybody else. I’m often trying to do comics that will make sense to somebody who has never read a comic, but I’m not sure that’s possible. I think there are certain people who are as dyslexic for comics as there are for other forms of language. Comics artists have talked about their specific galvanic responses to things, which apply in different ways, of course, to makers of different forms, but I think of Chris talking about Charles Schulz, or Crumb talking about his first sexual response being to Bugs Bunny in drag. Is there something you see in other work that you’d like to find a way into? Is there something of these hieroglyphs from things you’ve absorbed, that you really have responded to or would like to evoke in someone else? There’s something about that kind of comic book style that Charles Burns responds to, and I do also, that comes out of Chester Gould and Milton Caniff and those kinds of guys, and later found its way into DC Comics and Marvel Comics. It’s all about putting ink on a page. To me, that’s the most visceral part of making comics. When I can get to the point where I’m putting black ink on a piece of white paper and making something of that, it has a visceral magic to it and that, to me, feels like the purest form of comics. Even though many of the comics I respond to, like Chris’ for example, have nothing to do with that at all. His work is not about slapping ink onto a page, it’s much more precise than that, but there’s something about that feeling where you get it just right. It has sort of a Zen quality, where things are balancing and working as abstract images while also creating many other things. There seem to be so many layers of what you’re doing when it’s all working. That’s what I’m always kind of aspiring to—to get to that moment where I can do that. Chris’ stuff, since RAW and the beginnings of Jimmy Corrigan in the pages of Newcity in the early nineties, for me, has a form of ellipsis, like most good comics works, but the way he moves around in time is elusive. He is consistently, insistently coming up with narrative effects that are both concrete and dreamlike. Similarly, and a number of filmmakers have said this, I was talking to Nicolas Winding Refn about this a couple of years ago, and he tossed off the observation that cinema is really what’s happening just outside the frame. Movies, in a way, are depicting something concrete, but in fact that implication is: move the camera one foot over and the monster’s got you, one foot over and you fall in love. I like that idea. I’ve always wanted to tell a story by not showing anything. Where you write a really melodramatic story and show only the moments that would be the dullest in that sequence of events and see if you could still make it dramatic and interesting. It would certainly be more interesting than if you just followed the usual template. Specific, yet elusive. I’m writing my own philosophy here as we speak. I think a couple of times you refer to Wicker Park as a slum. It felt like it at the time. I actually returned to Wicker Park, the part that I knew, for the first time in probably fifteen years a couple of years ago when I saw you at the Printers Row Lit Fest in 2011. They have those kind of European sidewalk cafes right across the street from where I lived and I remember at least every two weeks there would be gunshots outside my window. One time I looked out and saw the guy lying on the street. And somebody pointed out to me, “Don’t stand in your window after you hear gunfire.” I was like, “Nobody can see me up here in my twelve-foot windows that are lit from behind.” I remember every year on Cinco de Mayo there were people who died from stray bullets shot into the air. I hear that’s an urban myth, except when you get hit. When you were sitting around on your artist’s tab, what did you and the others gossip about? Coffee? Girls? Money? Hopes for useful instruction? We were just trying to figure out our place in the world. Up until directly right before that, right before Quimby’s opened and comics like “Eightball” and “Hate” were starting to be read by actual people who weren’t comic store guys, we were really trapped in a world that we didn’t have any relation to. We were just emerging from that world and finding that, as we hoped and imagined might be the case, we were actually appealing to an audience of people who were interested in independent film and weird TV shows and strange LPs and things like that and that was starting to be our audience. We were trying to figure out who we were. We were kind of cagily trying to ask each other like, is this? Are we? Are we actually really cool now? [laughs] Trying to figure out what was going on. I was so energized by the fact that people actually seemed to care about this stuff, but also it was scary and it was kind of befuddling. You felt like, is this going to last ten minutes or is this the beginning of something that will go on and on, or what? You started “Eightball” in Chicago. Was there a “shazam!” moment? Do you get “Shazam!” moments anymore? It wasn’t so much that. It was just having all these saved-up ideas I wanted to get out into the world. 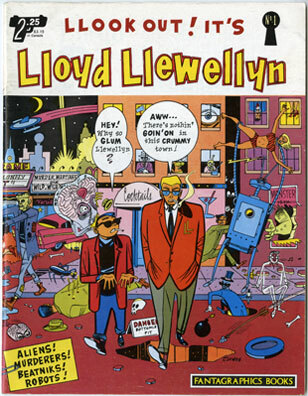 Before that I had done this comic, “Lloyd Llewellyn,” which was sort of imposed on me by my publisher. Back then, the conventional wisdom in the tiny world of black-and-white comics was that people wanted to read about a certain character. Nobody wanted to buy a thing that was just a whole bunch of different stories thrown together. So when I first started “Eightball,” I was kind of begging them to let me do two or three issues just to get all these ideas out there, and then I was going to go back to school, or whatever it was, after I had these few issues out in the world. It really was just that. I wanted to do my own underground comic or MAD magazine kind of thing, where I was doing all of it. I had this notion that I could do anything at all no matter how disparate, and by the simple fact that they were all done by me, they would somehow interrelate in ways that I probably couldn’t even figure out myself. So you were trusting your subconscious to pack the luggage. Yeah, or just trusting that anything coming from a specific personality—it’s almost like if you were to do a watercolor painting. The way you begin is you kind of paint a background color, and you paint everything over that, and it gives a certain uniformity to all the colors. It was something like that. There was some link between all these things, and the farther apart, the better in many ways, because then there’s all kinds of interesting stuff in between those two things. There was no thought about authorship. You were boldly trusting that it would work. Yes. And having no faith in that at all [laughs] actually. But that was the beauty of it. I didn’t care that much if anybody liked it because I saw it as an absolutely doomed venture from the start. Are there any current projects you want to jinx by talking about them? None of the movie things are not happening. They’re all in that state where the phone calls still come every week or so. You found the optimistic way to say it—none of it’s not happening. That’s the only way to think, because nothing, until the check clears, nothing is happening. As you well know. 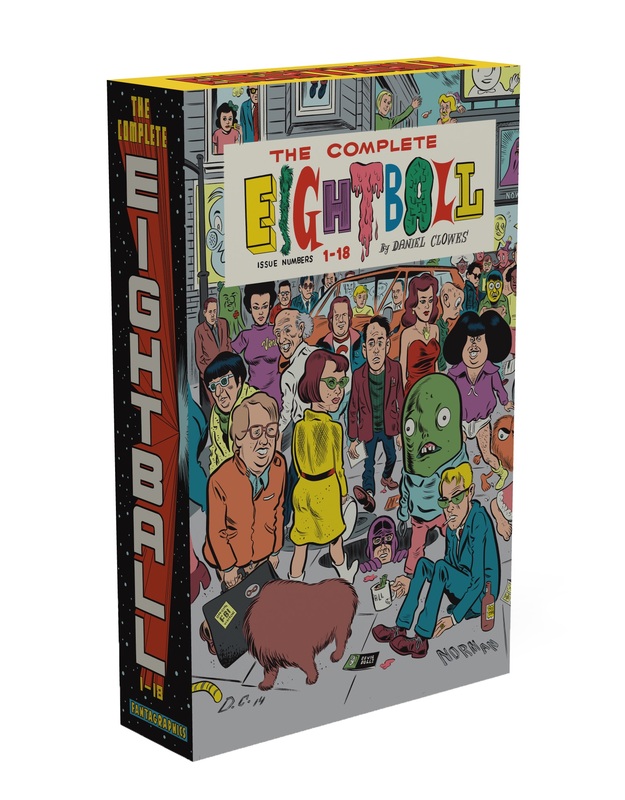 On April 30, Clowes will be signing “The Complete Eightball 1-18” at Quimby’s, 1854 West North Avenue, (773) 342-0910, 7pm.